Then this past summer whilst cleaning the basement we realized we had nearly 14 pounds of honey … and that it was six years old. Coincidentally, we had recently picked a large amount of elderberries. Sarah had originally intended to use the elderberries to dye yarn, and her mother, Nancy, intended to make a medicinal syrup, but they had so many elderberries they were looking for other options. Time to make the mead… and a melomel. The recipe below used approximately 13.5 pounds of honey; in our case, Tunbridge World’s Fair blue-ribbon-award winning honey we got from our friend and neighbor, Chuck, which we did not want to go to waste. In a large kettle dissolve the honey in warm water. We decided to bring the honey water up to about 160ºF with the idea that this would make sure that the yeast we chose could flourish over any natural yeasts. I have no idea if this is the case or not. The downside to this method is that it took hours to bring the honey water back down to a temperature safe enough to pitch the yeast. We collected our honey water in a 5-gallon glass carboy, and pitched the yeast slurry — and 1/4 tsp yeast nutrient — at around 78ºF and then added the airlock. In 30 days or so, we will separate and rack the mead to two separate vessels. 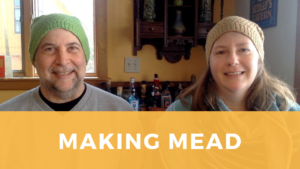 In Part 2 we discuss the next steps to transform a mead into a melomel. Check out Part 2 for more details. Rick is a craft brewer, shepherd, gardener, photographer, writer, tech nerd, web developer, and all around good guy.